This winter has been one long freezing snowfest with snowstorm after snowstorm rolling in over Copenhagen. 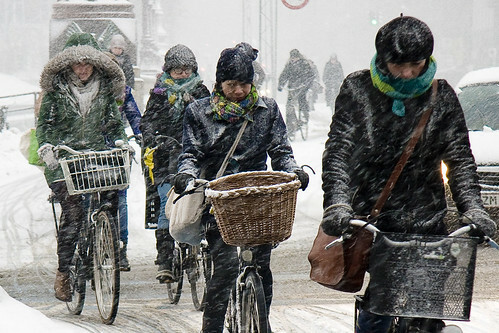 Nevertheless, 80% of Copenhageners who cycle each day continue to do so through the winter. Granted, there are even fewer in weather like this, but there are still a few hundred thousand citizen cyclists out there going from A to B and on to C.
While our Nordic genes long hungrily for summer as they have done for millenia, we here at Cycle Chic prefer to be optimists wherever possible. One thing this grumpy winter weather has given us is a fanastic fashion insight into the wealth of accessorizing options out there on the streets. Hats and scarves and mittens and boots that may not otherwise see the light of day in a mild winter have been dug out of closets across the city. In the photo above we can see the classic Copenhagen scarves in action. Digging them out is one thing, creating an ensemble is quite another. It's especially headwear that is enjoying a renaissance in the chill. This winter we've seen the fashion revival of the retro ski hat and a wave of Russian-inspired fur hats with flaps. Then there's the sequined flapper-style hats and that old evergreen, the beret. Lest we forget the hood. Fur-cuffed gloves and funky, wooly mittens feature strongly in the city. The normally fashionable long boots of discerning fashionistas have been replaced in many cases by warm winter boots. Although this year's closed heels continue to spite the snow, as do the biker boots. With eyes squinting into Arctic winds there is a feast for the fashion-hungry on the bike lanes of the Danish capital. Great shot; it's snowing here heavily now - in northern England. That looks really cold ! Just posted a link to this on my blog. I live in snowy Montana, so shots like these are definitely an inspiration to me as I try to integrate biking into my daily life year-round, without having to invest in lots of specialized gear. That is so funny how we both focused on the extras today, on the blogs. It really is super entertaining to watch the accessories this time of year, and if you pick the right ones, crossing a blizzard on your bike is really no biggie. This is quite embarrassing for Montreal. This winter (unlike the past two or three) has been quite mild, with very little snow compared to the usual. This is why I was attracted to your blog oh-so-long-ago... In the depth of a Minneapolis winter the likes I had not been in for 20 years, I found you, your optimism, and visual inspiration. Thank you. I too have been appreciating the winter fashion the stylish members of my city 'sport' on a cold day ~ they know how to do it and I am proud!